DeWees was one of the early settlers in Stephen’s Austin’s colony in Texas. His book claimed to be a series of his letters written to a Kentucky resident named Cara Cardelle between 1819 and 1852. In fact it was a volume of his dictated reminiscences, actually written by Emmaretta Kimball, who was born in 1829. The accuracy of this particular reminiscence, which is said to have happened in 1821, is thus questionable. I was unable to find any separate reference to corroborate the incident. Still, I thought it was a striking story so set out imagining how it might have happened. The great irony, given DeWees’s anecdote, is that on May 18, 1825 Dill shot and killed a man named Charles Duboys or Dubois. In the subsequent trial, a twelve-man jury found Dill not guilty, being “perfectly justified in taking the life of sd. Dubois.” (3) The governor reversed this verdict, on the grounds that Mexican law did not authorize trial by jury. He ordered Dill rearrested. 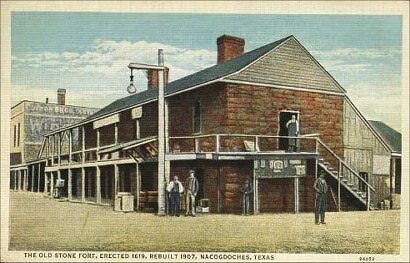 Rather than face another trial, Dill fled to Natchitoches, in Louisiana, in June 1825. On November 21 of that year, he died as a result of falling from a horse. W.B. DeWees, Letters from an Early Settler of Texas (Louisville, KY, 1852), pp. 21-22. Lester G. Bugbee, The Texas Frontier, 1820-1825 (Harrisburg, PA, 1900), p. 110. Jack Jackson, Indian Agent Peter Ellis Bean in Mexican Texas (College Station, TX, 2005), p. 31. A gentleman who had been into Mexico on a traveling expedition came into the place and presented himself to the Commandant, telling him that he deserved death and desired he should hang him.